While we had the car in for an alignment and some other maintenance, we had the oil changed. Following Red Line’s recommendation, we refilled the engine with their 15W50 synthetic oil. To get a better picture of our engine’s health, we sent a sample of the old oil to Blackstone Laboratories. Their mailer features a container inside a container so that it can be sent via regular post. And good news: The Blackstone report said that things looked good. Going forward, we’ll regularly have our M3’s oil analyzed. When we bought our 2004 BMW M3, a big, big question loomed: How were those rod bearings? The E46-chassis M3 has a bad rap regarding rod bearings issues, and even though our car was built after BMW made an update, we were still concerned. Hey, we like to worry. Was the engine about to come apart? Should we plan to replace the bearings asap? After refilling our sump with fresh oil–specifically Red Line 15W50–we sent a sample of the used oil to Blackstone Laboratories. That’s their specialty: used oil analysis. Their lab work would reveal the true story. They provide the specimen bottles for free. Fill up as directed, complete the paperwork, and return via post with a $28 payment. The report would arrive via e-mail. So we sent off the sample along with our heartfelt note and waited. For a second opinion, we sent the report to James Clay at BimmerWorld. His reply: stop worrying. 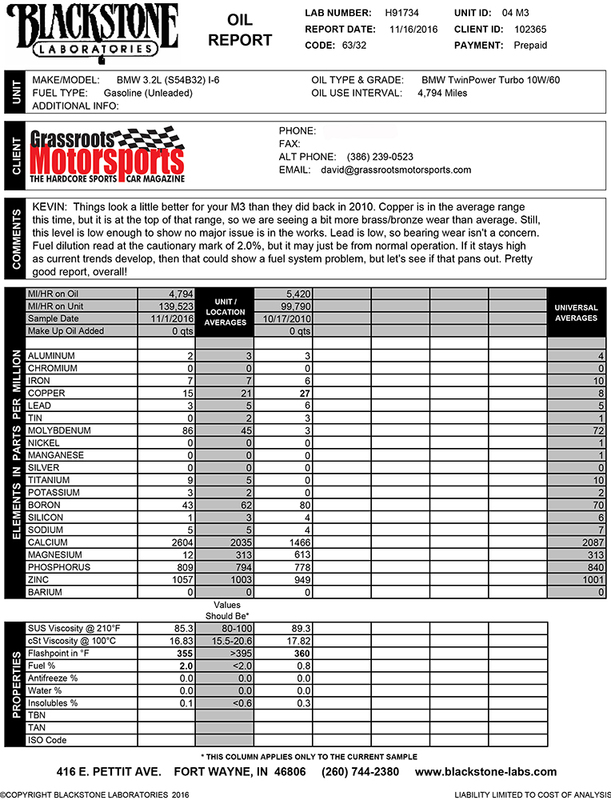 For a third option, we sent the report to Cameron Evans at Red Line Synthetic Oil. His reply: Yes, please stop worrying. Both added that we should allow the engine properly warm up–ideally 180 degrees before applying any heavy load or high rpm. In fact, they both said, allow the car to warm up before leaving the garage each morning. “The short commutes that never get up to oil temp are the kiss of death to these cars,” Evans added. “That’s why BMW’s choice of 10W60 is so problematic! If you have a short, slow speed commute, and never get up to temp going to work or from work, that means the engine spends most of its life with lubricant that is never working correctly. “When the oil doesn’t get hot enough, it doesn’t trap contaminants and creates that famous sludge. Also, when the oil doesn’t get up to temp, the additive packages in the oil don’t help to control wear. Plus, thick oil doesn’t get into the bearings properly. For engines that are going to be worked hard, though, Clay stressed that a 15W50 oil should be used. “The 40WT is fine for commutes, but the high revs need the thicker oil for bearing protection,” he adds. So we’re following their advice and allowing the car to properly warm up. Next, we have some suspension bushings to replace. I'm half tempted to send Blackstone a sample of my oil just to see what their response is. I'm thinking Bill Cosby in the Noah's Ark sketch. Would a block heater help with a short commute car? Get the engine up to temp faster? Having lived in extreme north (Fairbanks, Alaska) and having vehicles with block heaters. Block heaters won't heat the oil, they are installed in freeze plug openings and keep the coolant from freezing. Now if you can find an oil heater, like for an air-cooled motor and/or modify it or something along that line in the oil sump, that may work. But then you'll have heated oil circulating in a cold engine. Have no idea if that would be beneficial or not. You can get heating pads that adhere to the oil pan. Many European cars have coolant-oil heat exchangers, warm coolant WILL warm the oil up. I would be shocked if an M3 did not have such a device. wlkelley3 wrote: Having lived in extreme north (Fairbanks, Alaska) and having vehicles with block heaters. Block heaters won't heat the oil, they are installed in freeze plug openings and keep the coolant from freezing. Now if you can find an oil heater, like for an air-cooled motor and/or modify it or something along that line in the oil sump, that may work. But then you'll have heated oil circulating in a cold engine. Have no idea if that would be beneficial or not. Warm coolant heats the engine block which would heat the oil.. A couple gallons of oil would heat up pretty fast when interfacing with a few hundred pounds of aluminum and coolant, I would think. The entire process was quite painless. I didn't realize they had gotten so expensive. That's good to hear (all of it). It is Christmas, and my reading skills may be impaired by holiday cheer, but what exactly is James Clay recommending for track driven cars? It seems you are using 15w50, then there is some advice about using 10w60 for cars that are worked hard (BMW specs this weight), and then Clay says 15w50, not 40t. I am a bit confused. For street, 15W50 or possibly even 10W40. You can get oil heaters with a big magnet that stick to the pan, assuming it's not aluminum. Having raced on ice for years with a full race engine, it can be tricky getting them to even start. You sure as hell want warm oil when it does. Used the magnet heater on the pan and a circulating inline hose heater/pump to get the block and oil thoroughly warm before even cranking it over. Excellent timing, I just got my first ever Blackstone report on my LS1 donor. I got an "Overall, good report!" pres589 wrote: 10W60 sounds like witchcraft. It's made out of pure unicorn horn, judging by how much it costs per quart. If you call just above freezing warm. Block heaters just keep the coolant in the block from freezing when temp is below freezing. One area by the heater may be warmer than the rest of the engine. Recirc heaters may be a little warmer because fluid is circulating, with block heater fluid isn't circulating. Oil isn't in the block during this time, below the block in the pan and not getting any heat. Maybe if worked in conjunction with a pan heater it would warm the engine and oil up. Seems to me I've heard of race team that will circulate warm coolant and/or oil through the engine to warm the engine before start. Impractical for daily use though. Several years ago, I remember noting an extension cord plugged into the fuel door on a Grand-Am Cup BMW--the car was in the garage at the time. Its use? Heater for the oil tank. wlkelly3, I think the Formula 1 guys circulate warm fluids to have the engine completely warmed up before startup. I think I saw that on the same show that told me that they don't let them idle, they constantly rev them to keep harmonics from setting up and breaking E36 M3. We had these pads Moroso made on the oil pan, dry sump tank, transmission and rear end for our stock car. We only got one lap for qualifying and needed everything up to temperature. If we had the time, I could explain a lot about the S-54 bearings to you! I have been swapping the rod bearings out in the '01/'02 Z3/M Coupes/Rdstrs for close to ten (<10) years. The Z3/Ms were not included in those initial recalls because of their 400 RPM lower redline. The original bearings were tri-metal (lead, copper, tin-alloy on a steel shell) and all the recall bearings (and M3s built after 04/03) as well as all the Z4/Ms use a bi-metal (tin/aluminum alloy, aluminum on a steel shell). As such, the Blackstone reports aren't nearly as effective, due to the harder wear surface of the newer bearings. I've been doing my own polymer coating (dry-film lubricant) since 1992, and have applied the same process to these; contrary to popular belief, it does not reduce the clearances, which admittedly are marginally tight when the process is done properly. The owner (of the Z3/M & Z4/M) is also scheduled to bring me his E-92 M3 (S-65 engine) but for that car, were planning to use some specially made bearings with an additional .0005" clearance (per shell, .001"gain, ideally yielding about .0025" running clearance). I'm hopeful that these bearings will soon be available for the S-54 engines too. GRM/CM: I'm practically in your backyard, you should stop by sometime! snailmont5oh wrote: wlkelly3, I think the Formula 1 guys circulate warm fluids to have the engine completely warmed up before startup. I think I saw that on the same show that told me that they don't let them idle, they constantly rev them to keep harmonics from setting up and breaking E36 M3. My understanding is that the clearances are so tight, if the engines aren't warmed up with fluid pre-start..............they simply will not start.